No fancy photography, just real food. With Mother’s day coming up this week I’ve seen a lot of sweet recipes being posted (which are great). But I found myself thinking about what the ultimate Mother’s day fantasy food is. I thought about my mum (and all the other mums I know) who all ask the same question “What to cook for dinner?” each night as they try to think of something they can cook that everyone will (or if there are food sensitivities involved) can eat. So although we’ve been having some uncharacteristically warm Autumn weather here in Adelaide, the mornings and evenings are certainly getting that cold edge and there is no doubt that the weather is changing and #winteriscoming (couldn’t resist;-). 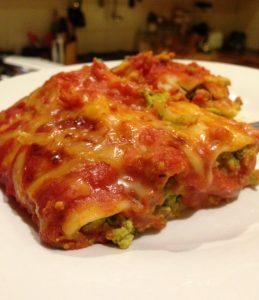 I’ve been finding myself drawn into the kitchen to make warmer meals, and because my son has been asking for lasagne, I’ve had a play with a few new lasagne and cannelloni recipes. As I’ve been playing with the recipes, I’ve found myself yet again thinking about the realities of everyday cooking. A little while back I shared a blog post about the perfectionism in cooking nowadays, from fancy knife skills to food styling and photography. The thing is, as most parents with fussy kids will understand, you can’t always make perfect recipes when you have a fussy (or food sensitive) child. Eg. it’s hard to “balance the flavours” when your child just doesn’t like one (or more) of them. Lately all my son wants to eat is sushi, rice and lentils or roasted sweet potato wedges. And I hear often from parents whose children will only eat egg and cucumber, or fruit but no veggies, or pasta without sauce etc… and they’re frustrated by how restricted their options are (fussy kids with food sensitivities makes the whole process even more “fun”). So when my son started asking for lasagne I was over joyed, then remembered that our favourite jar sauce had become impossibly hard to find and I’d have to create my own. I found myself staring at the fridge and the pantry and wondering how I was going to turn it into something exciting because he doesn’t like strong flavours at all. He’s not a fan of “tang”, he doesn’t like anything “too salty” and he’ll tolerate green – but not parsley (he’ll do his best to take every visible bit of parsley out of his food before he eats a mouthful). Transfer 1 cup of the passata and the sweet potato into a tall jug and puree with a stick blender until smooth. Transfer the puree and the remaining passata to a saucepan and add 1 cup of water and stir again until it is all mixed in. Grate the garlic clove in to the sauce. You can either use the sauce directly on the cannelloni or bring it to the boil, simmer for 30 minutes and then use on some pasta which is suitable for your diet. Transfer soaked cashews to a food processor and add water, butter beans, nutritional yeast, apple cider vinegar and garlic (I grate it first). Puree the mix until smooth, being sure to scrape down the sides between blending. Once the mix is smooth, add two handfuls of baby spinach and pulse until the spinach is mixed in. Drizzle a little of the simple sauce on the bottom of an oven dish. Use a little coffee spoon to tap the spinach and dairy-free ricotta mix into instant gluten-free cannelloni. Cover the cannelloni with more simple sauce and then top with a cheese that suits your diet. I’ve used the biocheese in this picture. Cover the dish with foil and cook on 180 degrees C for 30 minutes, then remove the foil and allow the cheese to turn golden (for a further 20 minutes or until the cannelloni are cooked through). If you’re pressed for time, you could layer the spinach and dairy-free ricotta mix between sheets of lasagne instead of cannelloni. Use the spinach and ricotta blend in other recipes (like sausage rolls, or filo pastry triangles – if your diet permits). If you like a tangier sauce you can add some apple cider vinegar or some extra salt to taste. You could mix and match this with some of the other ideas from our Lasagne episode. Now I’d love to hear from you, do you have fussy eaters? What combinations of foods are you cooking with (or without?) What is the most frustrating thing you find? Is there a recipe that you love that you’d like to make fussy/ food intolerant /free-from and family friendly? Let me know in the comments below. And if you’re beyond all of that and you just want someone to help you put it all together and show you how to create alternatives, make substitutions and transform recipes yourself, then check out the Your Alternative Kitchen ecourse.